We’ve finally made it 700 (702.2 to be exact) miles through the desert and could not be more excited for the snow to come! This section of desert tends to wear on people and for good reason. The sun and heat are relentless and there are so many miles of burn. 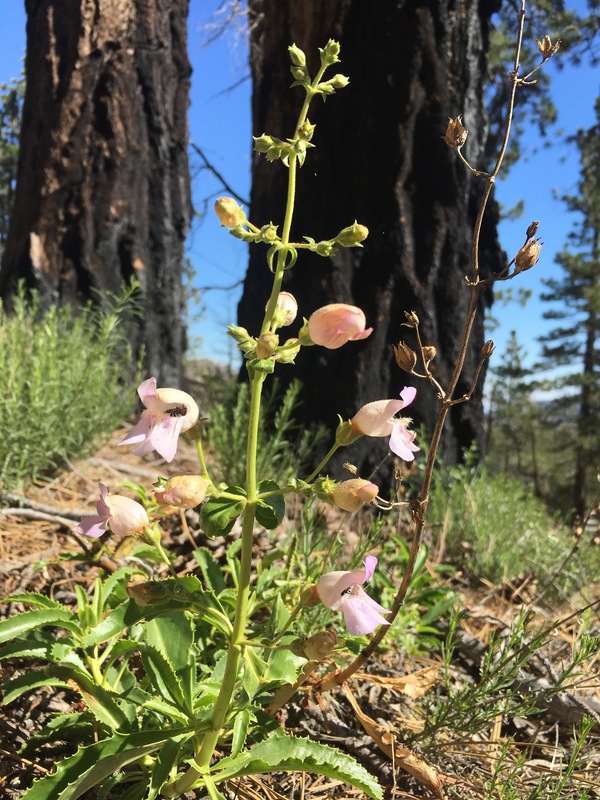 As grueling as these burn areas may be, they’re are also beautiful and full of life. 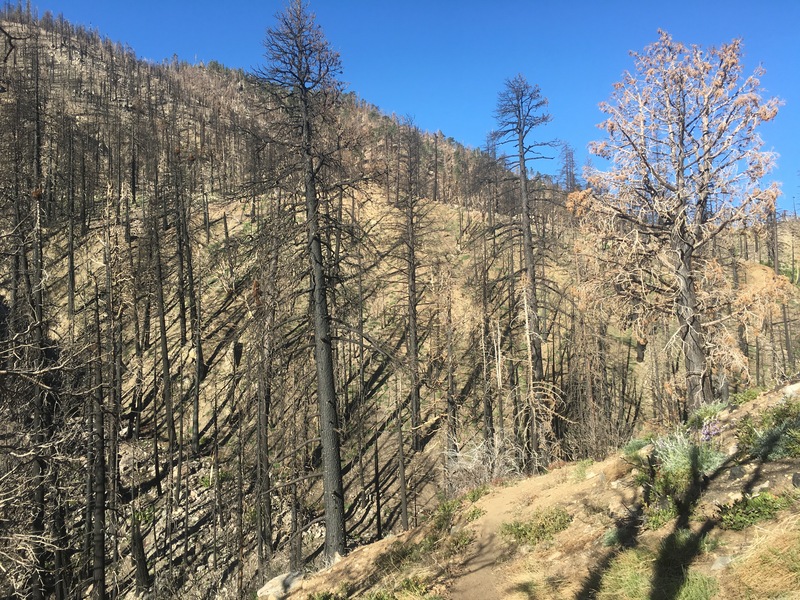 It’s easy to notice the towering burned trees, not as easy to notice some of the dwarf flowers like desert calico (Loeseliastrum matthewsii) and cushion cryptantha (Cryptantha circumscissa). 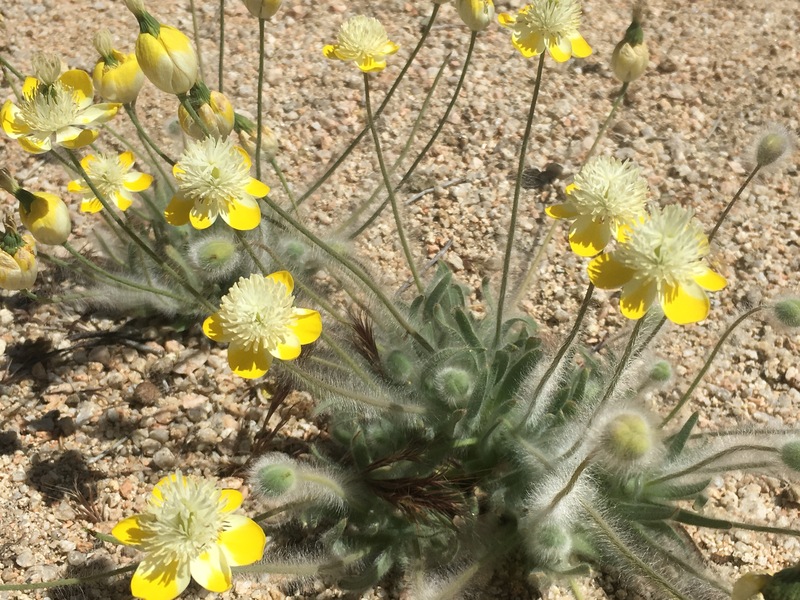 Many desert plants have trichomes, or hair on their leaves and/or stems. 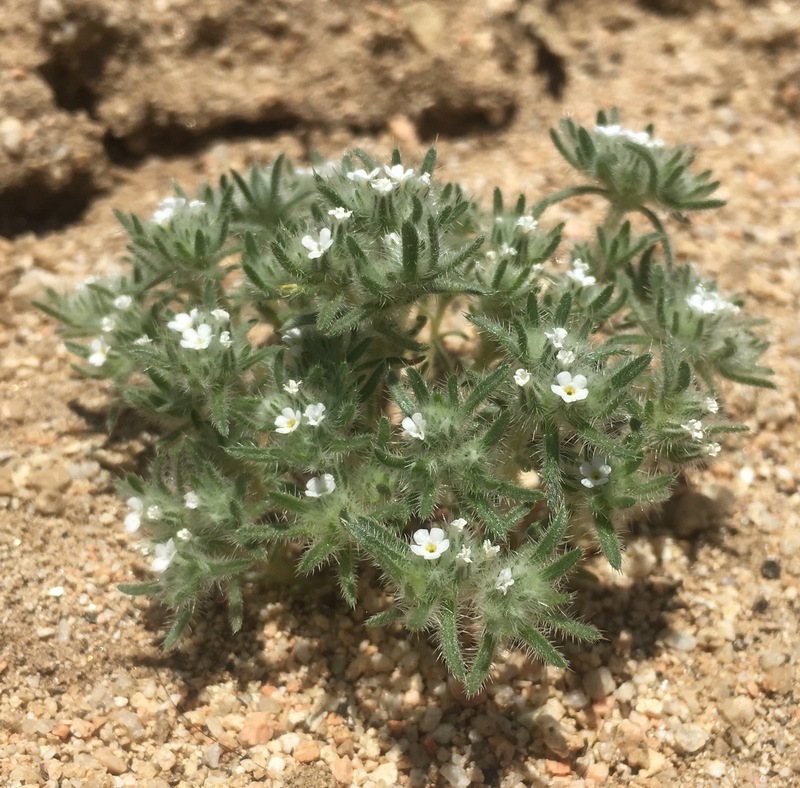 Some, like desert calico and cushion cryptantha, are spiny and unfriendly to the touch. 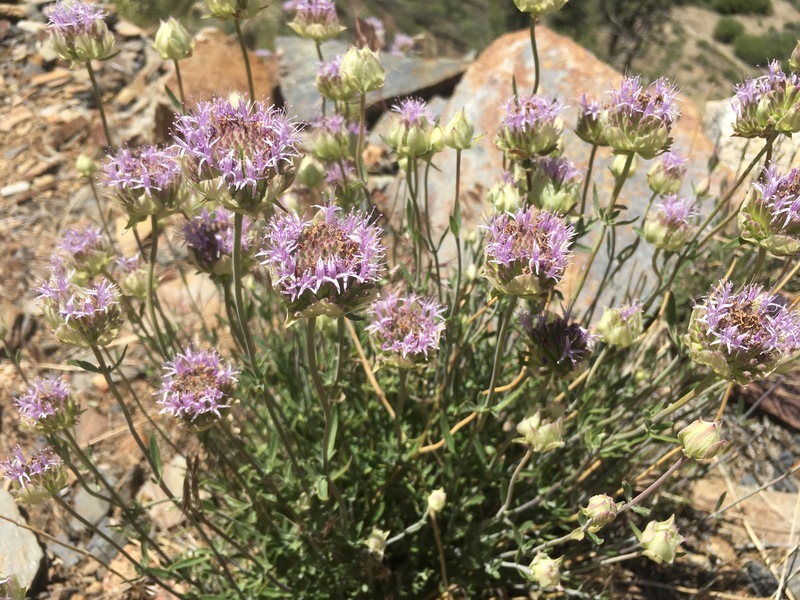 Others, like two-color phacelia (Phacelia bicolor) and creamcups (Platystemon californicus) are more wooly and soft to the touch. While trichomes peak my tactile interest, they also serve a purpose. The hairs can restrict insect movement and herbivory on leaves. They also reduce the rate of transpiration, or water loss, by reducing the amount of air that’s able to flow across the leaf surface. 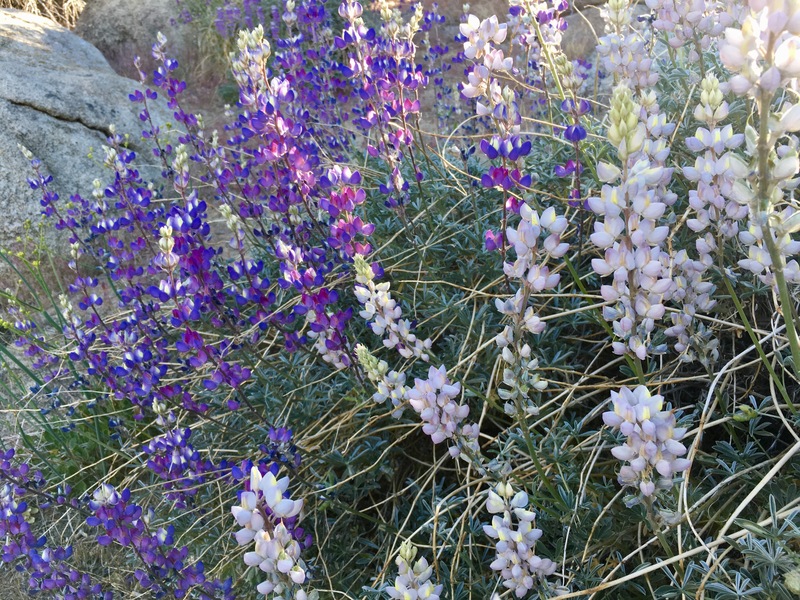 There are over 50 species of Lupinus in Southern California which is very exciting for a lupine lover like myself. 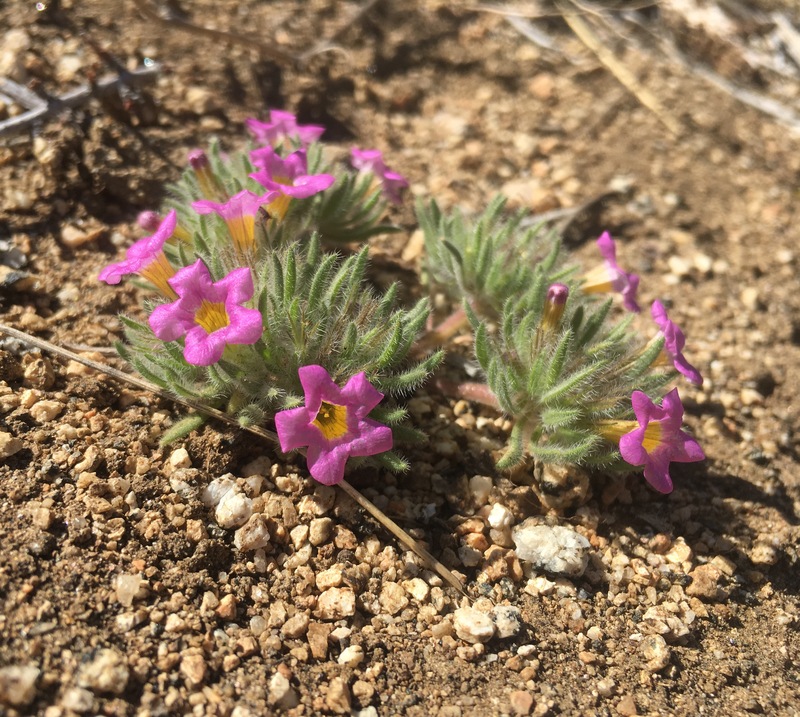 These flowers are one of the first to repopulate an area after fire and bring some much needed color to the landscape. 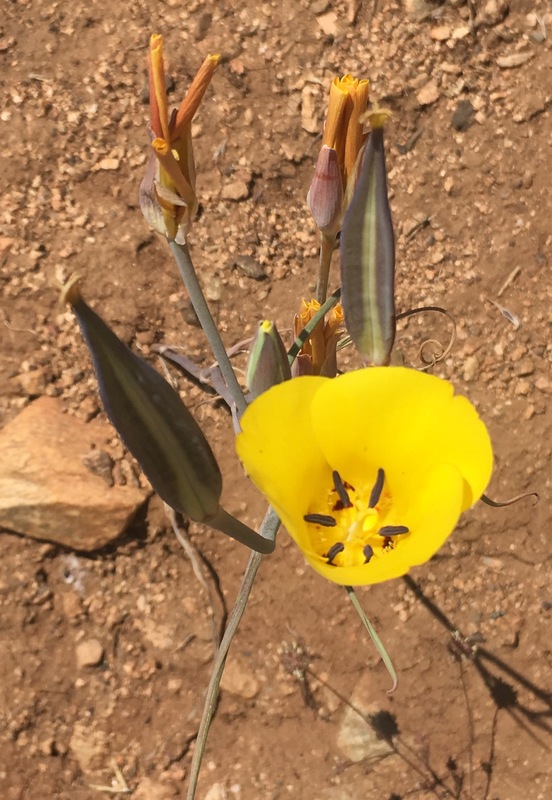 One of the most exciting finds in this section was this butterfly mariposa lily (Calochortus venustus). 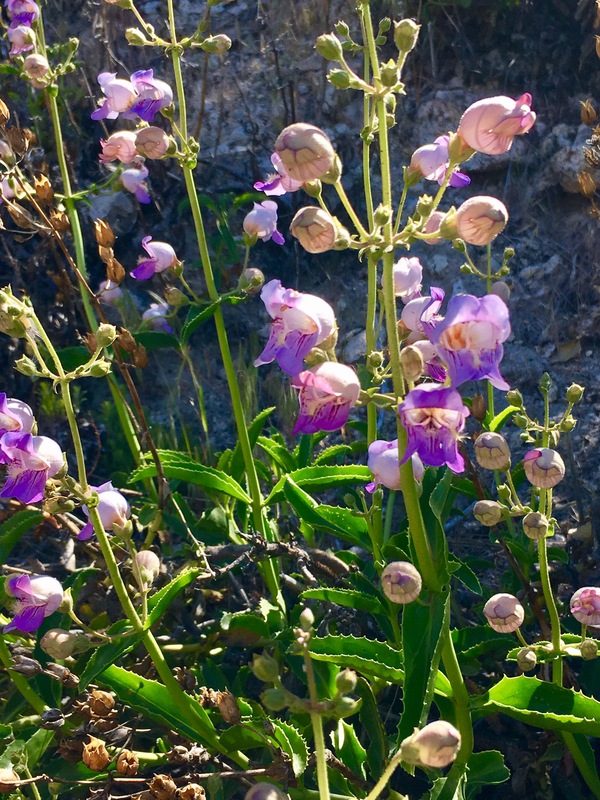 These flowers are endemic to California, meaning they’re native and growth is restricted to particular areas. 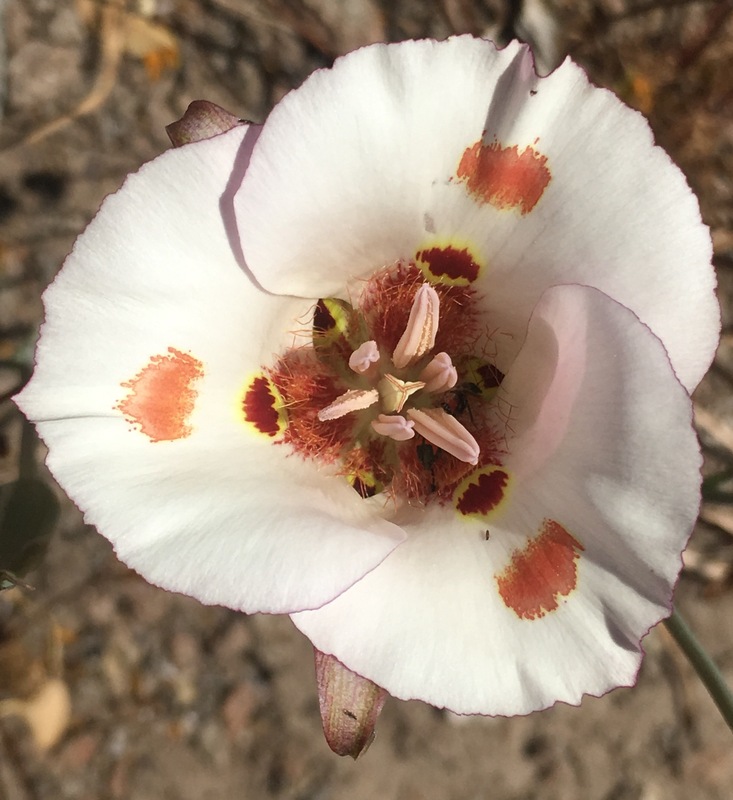 The desert mariposa lily (Calochortus kennedyi) is native to California, but not endemic. 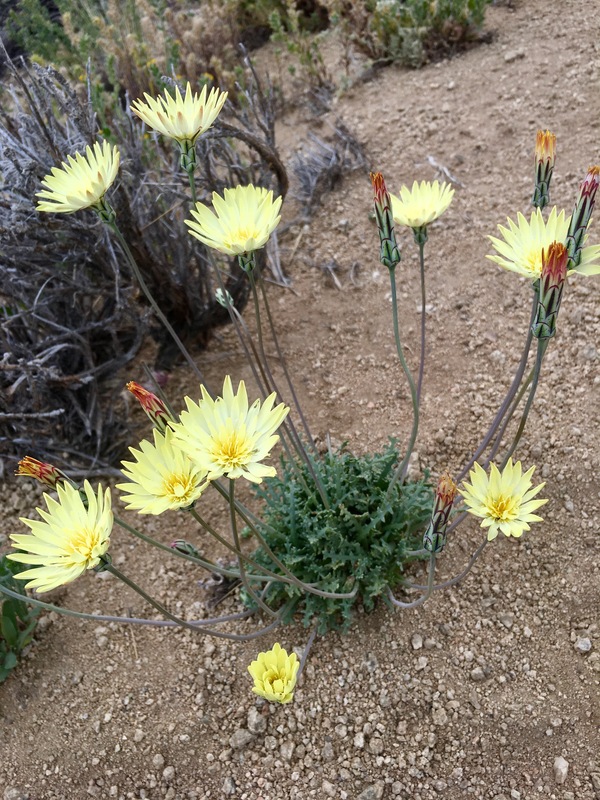 They are common in the Southwestern US and come in a yellow and orange variety. See Part 1 for orange. 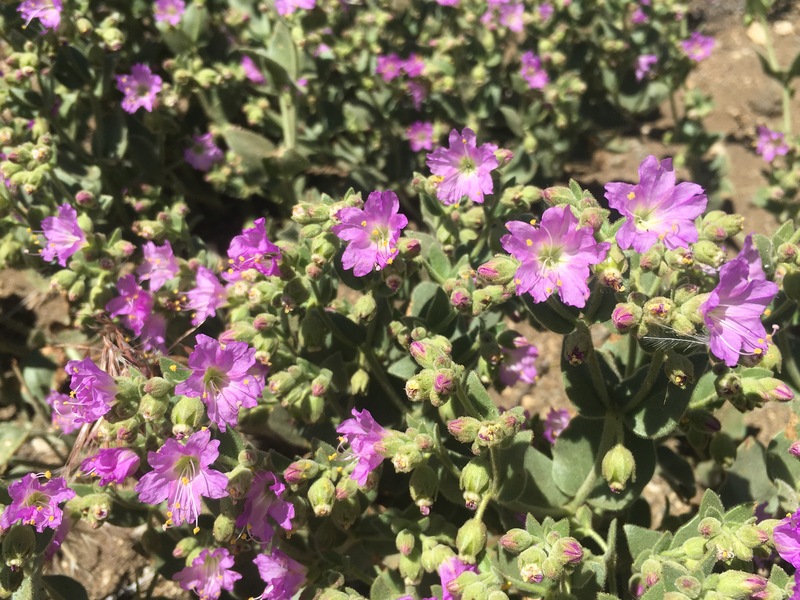 Clarkia are difficult to capture on a good day with my iPhone due to their small nature and the wind. But they’re beautiful and also uncommon so we just have to deal with the poor quality. 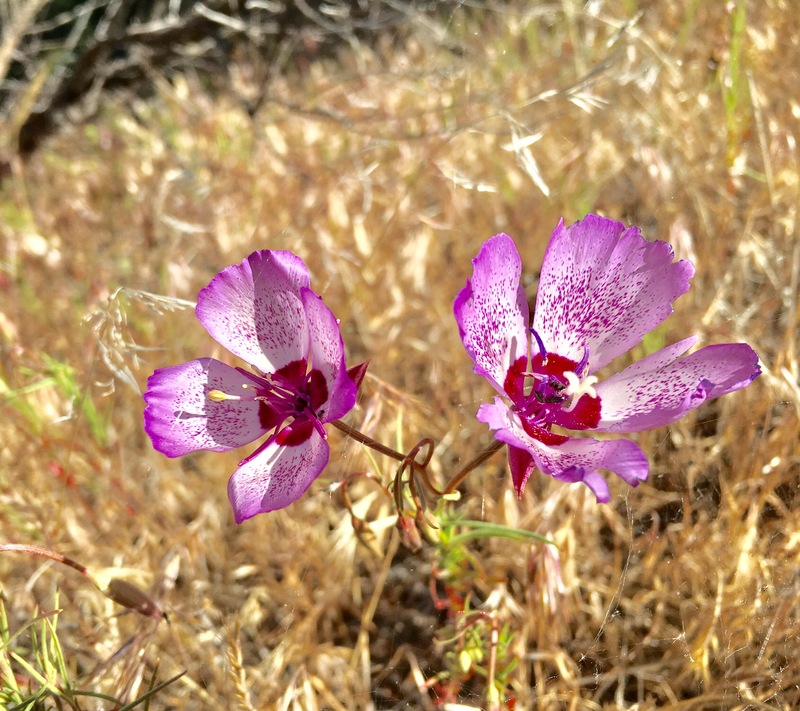 Elegant clarkia (Clarkia unguiculata) and two-lobe clarkia (Clarkia biloba) can most easily be distinguished by their flower petal shape. Elegant clarkia petals are paddle shaped while two-lobe clarkia have heart shaped tips. 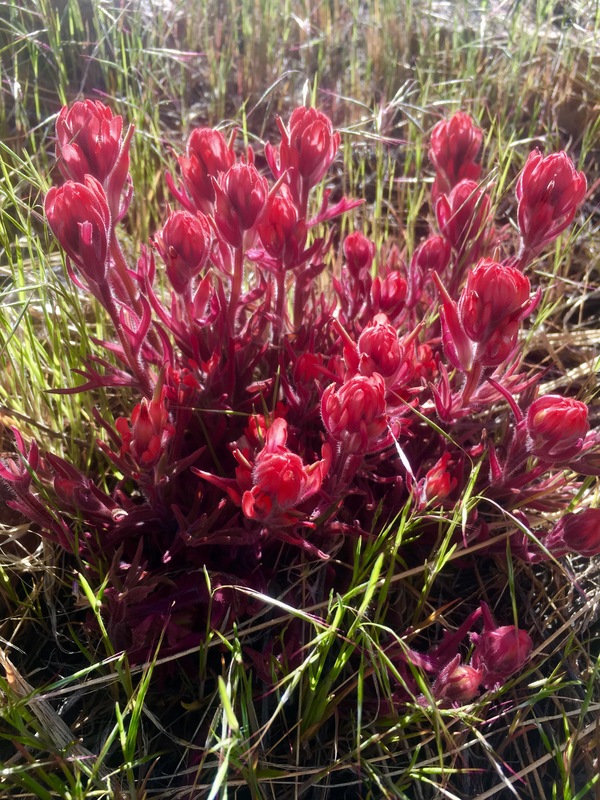 Very few days passed that we didn’t come across a species of Indian paintbrush (Castilleja). 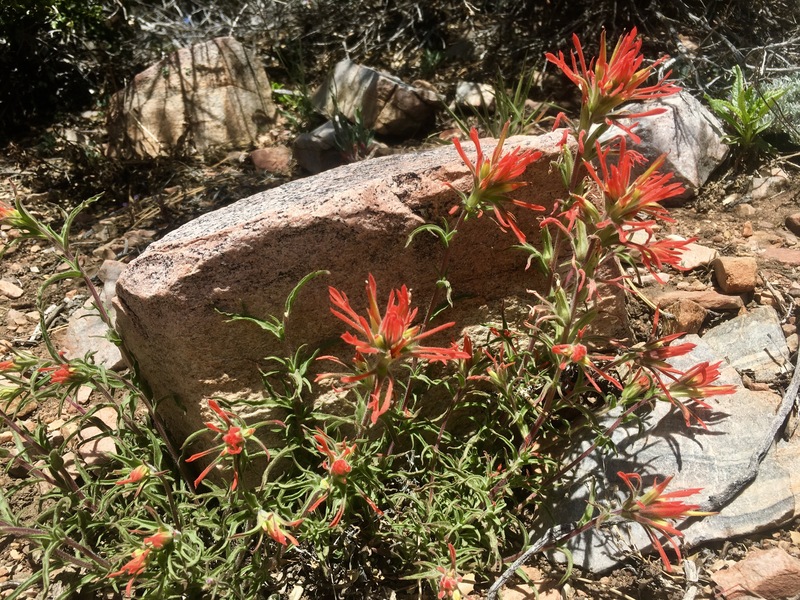 In fact there are so many species of Indian paintbrush and lupine that I could spend six months trying to identify individual species. But there are miles to be made and just not enough time for that. 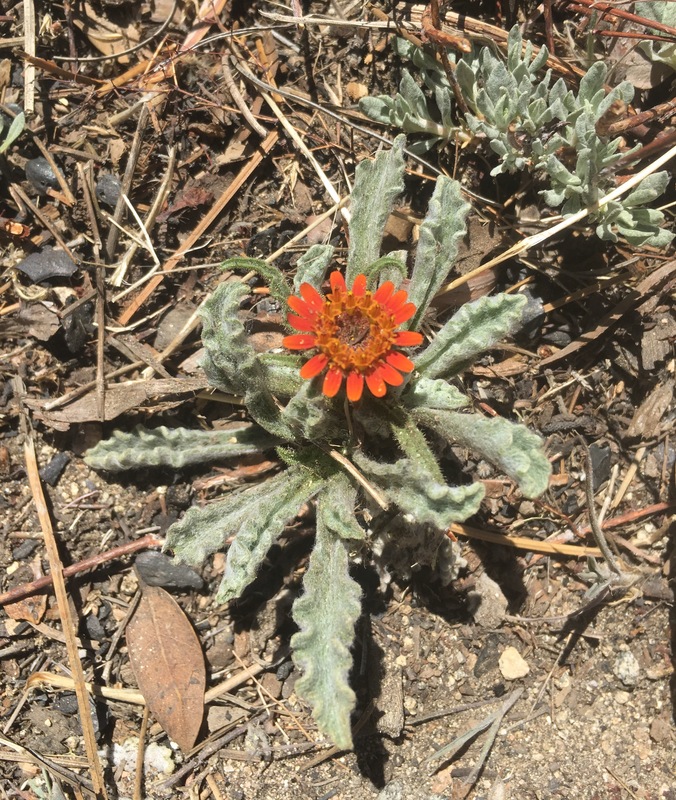 This is a particularly red Indian paintbrush. I wish I could give an explanation as to why it’s so red, if anyone knows I’d love to hear! This genus of flowers are pretty incredible. Not only are they capable of growing in unforgiving landscapes, they do so with very small leaves. So how do they photsythesize and get nutrients you may ask? 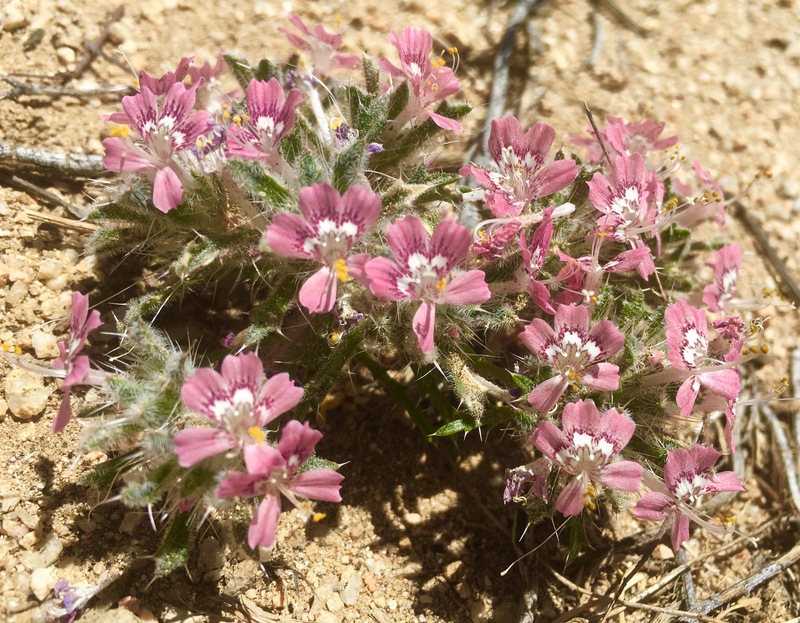 Castilleja species are parasitic plants. Their roots have tubes called haustoria that absorb moisture and nutrients from other plant roots it comes in contact with. There are many species of Penstamon, another species that seems to be one of the first to colonize recently burned sections. 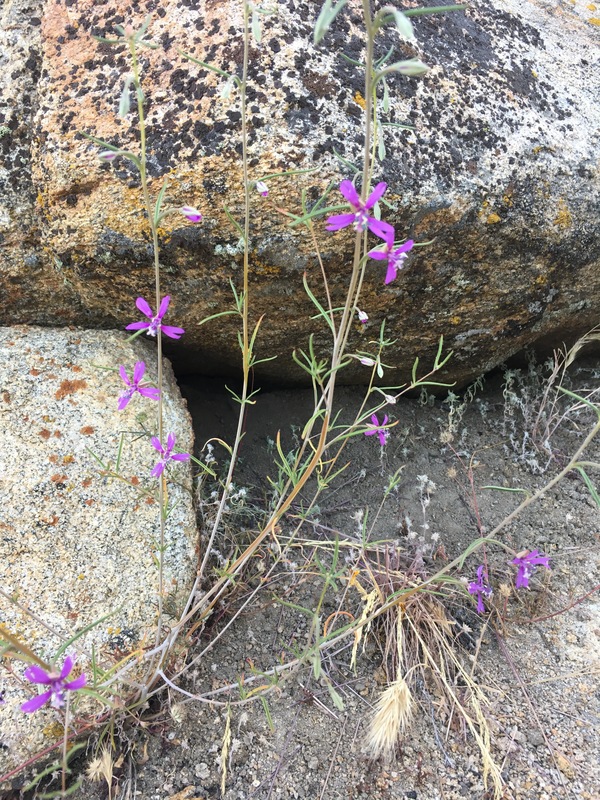 This wishbone bush (Mirabilis laevis) is in the same genus and Colorado 4 o’clock identified in Part 1. 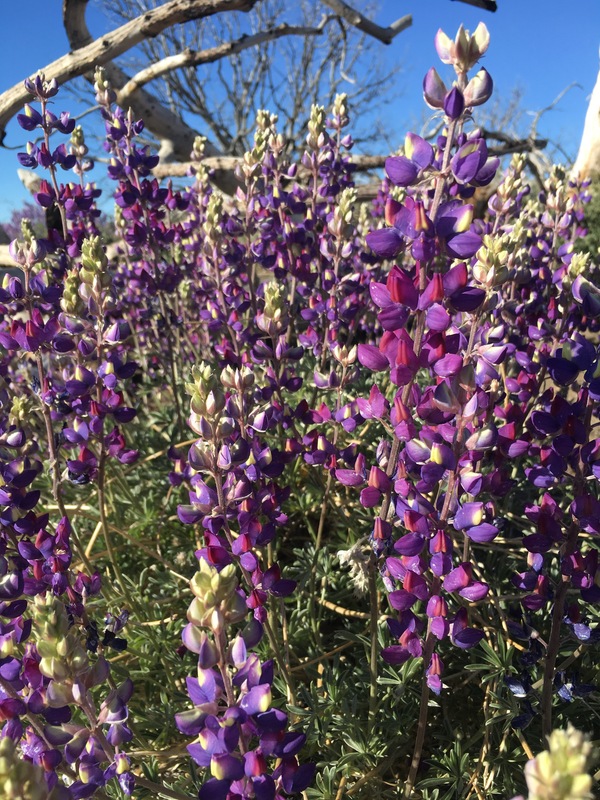 They are a wonderful pop of color in areas dominated by Joshua trees and sagebrush. In our time out here I’ve only spotted this single red-rayed alpinegold (Hulsea heterochroma). 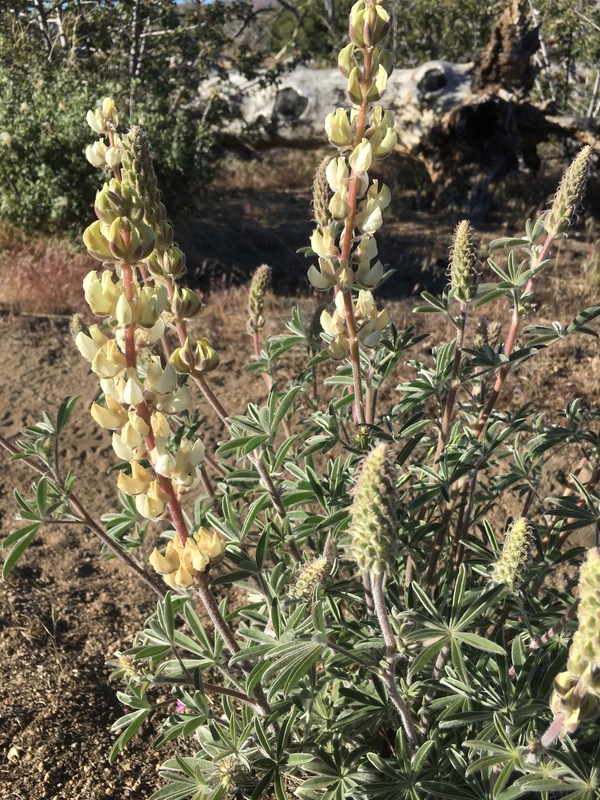 Scale bud (Anisocoma acaulis) is very common in the Southern California desert. It also happens to be the only known/identified species of its genus. 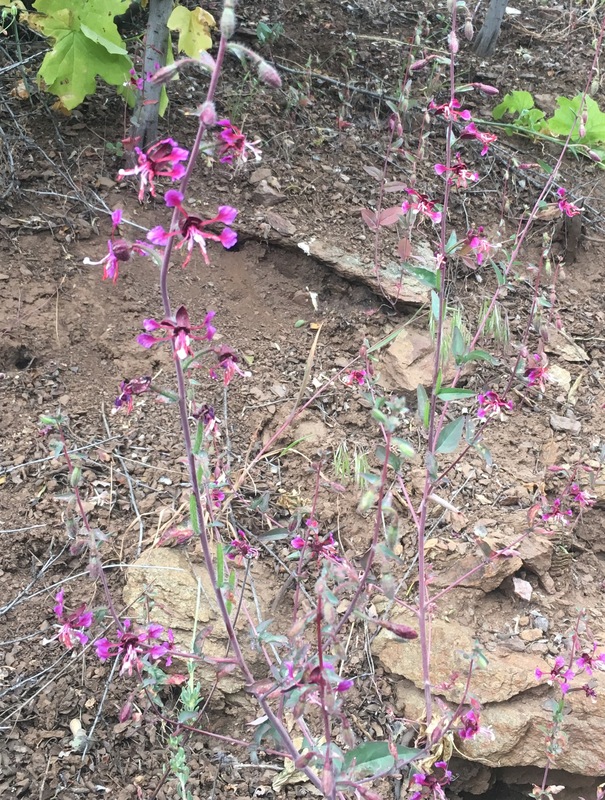 This mountain beebalm (Monardella odoratissma) became more common as we approached Kennedy Meadows. This flower has a wonderful smell and like all other members of the mint family, has a square stem. And last, but certainly not least beautiful, is this speckled fairyfan (Clarkia cylindrica). Thanks for sharing these elegantly written snapshots of your journey! Great post! My wife and I have been “micro-section” hiking some of the trail here in southern California. 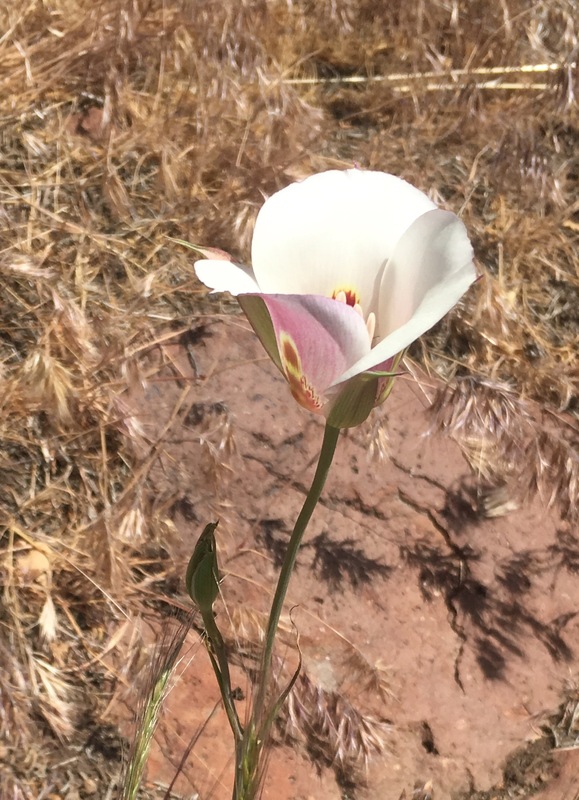 When we did the section from the Acton KOA to Vasquez Rocks, we saw acres of orange Mariposa Lillie’s. There were so many it looked like a poppy field. Earlier in the spring we were just south of Lone Pine and found a field of red ones. 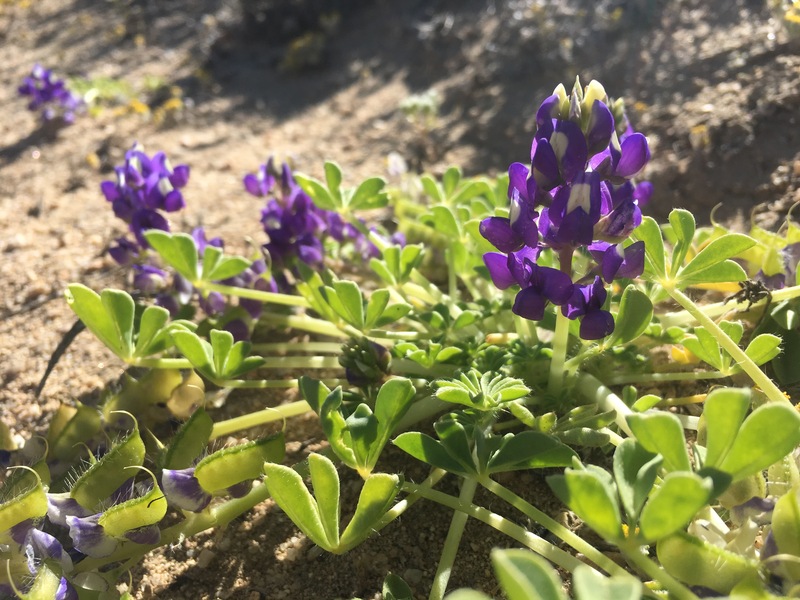 My wife has a lot of flowers on her Instagram from the area if you want to check them out. Her username there is cbc9000. Love seeing all the beautiful flowers and landscape! So amazed by the variety too!